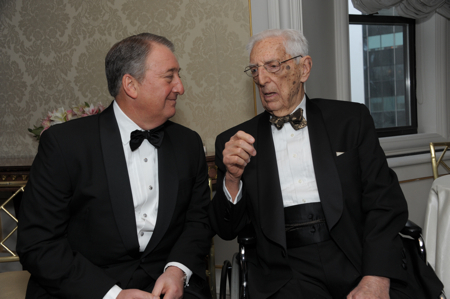 On May 16, 2011, Abby and Howard Milstein paid tribute to Dr. Howard Jones, a man who they described as their “hero.” In honor of Jones’ 100th birthday and his breakthrough work, the Milsteins hosted a party at the St. Regis Hotel in New York. In a room filled with the leading figures in the field of reproductive medicine, the Milsteins encouraged the passing of the torch to a new generation of doctors. 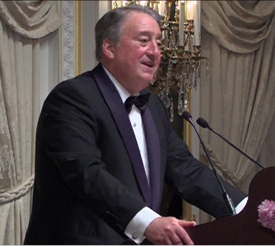 Howard Milstein is Chair of the Howard and Georgeanna Jones Foundation, which supports research at the Howard and Georgeanna Jones Institute for Reproductive Medicine. A lead gift from the Milsteins enabled the building of the Institute at the Eastern Virginia School of Medicine. Later, Howard Milstein was instrumental in ensuring that the Foundation received a pro rata share of $20 million in patent revenues, which supported research at the Jones Institute. Howard Milstein speaks at a salute to Dr. Howard W. Jones, followed by remarks by Dr. Jones.